HOW OFTEN DO YOU MEET? The regiment has only one meeting a year; an enjoyable annual gathering that takes place in the Philadelphia area. Any other business to be discussed by the membership is handled at brief meetings during scheduled events. WHERE DO YOUR MEMBERS COME FROM? While we say that we are “based in Valley Forge,” our membership actually comes from several surrounding states. The majority are from Pennsylvania, New Jersey, Delaware and Maryland, but others come from New York and Virginia as well. We even have a couple active members scattered as far away as South Carolina and Florida. HOW MANY EVENTS DO YOU HAVE EACH YEAR? There are about 20 events each year. Most are one-day programs, with about three or four “weekend” events. WHAT IF I CAN’T GET TO EVERY EVENT? No problem. Few members can. We hope you will participate in as many as possible. You can attend as few as one quarter and still be considered an “active” member. WHERE DO MOST OF THE EVENTS TAKE PLACE? Our programs are usually at historic sites and parks in the mid-Atlantic region. One or two events each year will be distant (i.e. Williamsburg, Va. or Saratoga, N.Y.) but, thanks to the rich history of this area, most will be within a 90 minute driving radius of Philadelphia. WHAT DO I GET FOR MY DUES? Your dues cover the cost of the wonderful, authentically prepared meals served to you at events and your coverage under our liability insurance policy, along with informational materials sent to the membership during each campaign. You are also able to use the regiment’s tents and camp equipment at scheduled events. The bulk of our funding comes from honorariums received from event sponsors. WHERE DO I GET MY UNIFORM AND EQUIPMENT? Unfortunately there is nothing like a reenactor’s supermarket where everything can be obtained in the same place at once. We have come close, however, with our well-stocked Quartermaster who can provide members with most of the correct equipment they will need to outfit themselves. We also have accomplished seamstresses who make our uniforms. We try to deal directly with the craftsmen and suppliers and we make no profit on anything you purchase from our Quartermaster, so most everything is available to you at substantial savings over “dealer’s” prices. HOW LONG BEFORE I CAN PARTICIPATE? You can begin right away! We maintain a supply of extra material to loan new members as soon as they join so they can turn out with us while they are getting their own gear together. HOW DO I LEARN THE DRILL? You will receive easy-to-follow instructions for performing the Manual Exercise so you can begin to practice at home. New members are also taught at events by our NCOs and there is always some time taken to drill as a unit. The Manual may look complicated, but it is really quite simple and can be mastered in a relatively short time. WHAT DOES YOUR TAX EXEMPT STATUS MEAN TO ME? We are one of only a handful of such groups who have been designated non-profit/educational by the Internal Revenue Service. That means all your expenses associated with the regiment and its activities are tax deductible: uniforms, equipment, gas, motels, food, phone calls, etc. Of course, everyone’s tax situation varies and you should consult your accountant to see how it will affect you. Most of us find this to be a very significant benefit of membership. JUST HOW AUTHENTIC ARE YOU? Within the realities of the 21st Century, we think we are about as accurate as a large unit can be and are proud of our authenticity. 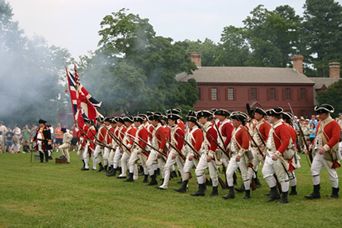 Both our British and American impressions have been rigorously researched and are based on original orderly books and inspection reports of the units we portray, archeological evidence and actual Revolutionary War gear in private collections and museums. HOW OLD DO I HAVE TO BE? Young men can join at the age of 10 as a fifer or drummer, if they have some skill with either instrument. They will receive further instruction from our musicians after joining. Mature young men can join as infantry at the age of 14 providing they are tall enough to handle a musket. At 15 they can begin participating in the ranks at most of our programs and the following year can also participate in the large, national battle reenactments. HOW DO I JOIN? download and complete an application and send it, along with your dues, to our recruit coordinator, Mr. A. Thomas Miller, 229 Howard Ave., Woodstown, NJ 08098-1249. The dues schedule can be found at the bottom of the application. See JOIN US for more details.